Tuffy says: Azuls Amigo Blue (Pistol) is SOLD. ONE OF THE BEST! WHAT MORE CAN I SAY??? This VERY blue colt is put up like a horse should be. For a youngster he has a huge hip, a cute little head, very correct structure and a really fun personality! He loves people! When he was born he had a small hernia. When the vet repaired the hernia he removed one of Pistols testicles. So he has one. His fertility will NOT be affected according to Colorado State University. A letter from the surgeon will be provided explaining the matter. He just had a hole in the wrong spot when he was born! He is a wonderful colt with a huge future in front of him! 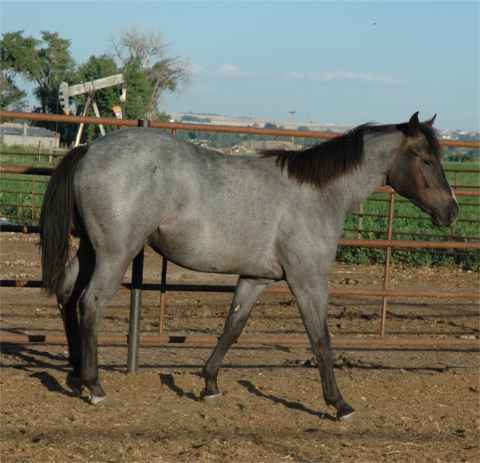 He has 6 blue roans on his papers and 1 red roan. So 7 of the 14 horses on his papers are roans! THANK YOU LARON AND LINDA ON YOUR PURCHASE OF PISTOL! YOUR BUSINESS IS VERY MUCH APPRECIATED!